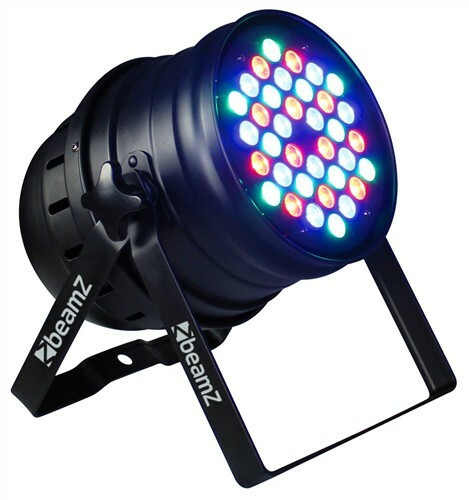 A 6-channel DMX light effect in a PAR 64 enclosure. Thirty-six bright red, green and blue 1W LEDs create a wide range of color effects. Set in sound activated mode, the LEDs change color to the beat of the music. Also includes pre-programmed effects. Easy to install, energy saving and long life operation. Suitable for the mobile DJ. 36x 1W RGB LEDs. Strobe and fade function. DMX LED display and keys. Universal DMX control or stand alone. 9 built-in programms. Master/Slave function. Sound activated or Auto mode. Double bracket also acts as floor stand. Daisy chain possibility (Power and DMX). Fan cooled. Energy efficient.